Confirmed State Harijan Conference - Recommendation by the conference for deputation by Scheduled Cast and Scheduled Tribe employees for Higher Education with in the country on full pay. 2.U.O.No. 2811/JFS(p)/77 dated. 26.8.1977 of Finance and Planning and Finance Wing Department. 1. The matter had been carefully Government with reference to certain categories of employment in Government in cases acquiring of higher qualifications in pre -requisite further their career. 2. Government have accordingly, decided that in cases where the acquiring of higher educational qualifications in pre-requisite for further promotion according to the rules, the scheduled caste and scheduled tribe employees should be deputed for higher studies within the country with full pay and allowances. a) This facility will be available only to first generation scheduled caste and scheduled tribe candidates in employment and non-gazetted categorise only. b) The period of study shall be two years or less according to for payment of full salary without loss of leave. c) In case there is any qualifying examinations, tests, etc., attached to the causes, only two chances will be allowed to the candidates. d) The candidate will sign a bond that he will come back and conveyance of the department which had given him this facility for shall carry a penality of Rs. 10,000/- (Rupees Ten thousand only) for fore failure. e) The facility will be given only to the candidates who have agreed record with a sense of discipline and responsibility towards work. f) The candidate should have put in at least five years of service in the category from which he is being deducted. g) This facility will be available for only one such training programme in a career spare of an employee. 1) This Deputation sanctioned only when the Higher study required for immediate/ further promotion post to the present cadre. 3) S.A Cadre Teachers are allowed for P.G /M.Ed Courses. 4) S.G.T cadre Teachers are not eligible for P.G/M.Ed courses Deputation. 5) Eligible deputation will be sanctioned after Successful completion of 5 years service without any E.O.L. 1. 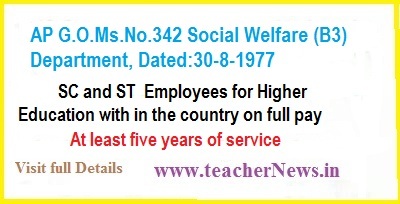 Scheduled Cast (SC) and Scheduled Tribe (ST) employees are eligible for for Higher Education Deputation. 2. The full pay and allowences have been paid during this Deputation. 3. The period of study should be two years or less . 4. This facility will be available for only one time in a career spare of an employee. Singareni employees son eligible for first generation certificate?.